Wilfork with the Texans in 2016. Vincent Lamar Wilfork (born November 4, 1981) is an American football nose tackle for the Houston Texans of the National Football League (NFL). He played college football for the University of Miami, was drafted by the New England Patriots in the first round of the 2004 NFL Draft, and spent the first 11 years of his career there. Wilfork is considered to be one of the premier defensive tackles in the NFL, and was named both to the Pro Bowl and the All-Pro team in 2007, 2009, 2010, 2011, and 2012. Wilfork was born in Boynton Beach, Florida, and attended Santaluces Community High School in Palm Beach County, Florida. There, he was a letter winner in football, wrestling, and track and field. In football, he won USA Today's second team All-American honors. In track & field, Wilfork was one of the nation's top performers in the throwing events. He was the Florida Class 4A state champion in the shot put and the discus in 2000. He also holds the Florida state high school record in the shot put with a throw of 68 feet (20.73 m). In the discus event, his top throw was 180 feet (54.86 m). Wilfork attended the University of Miami, where he played for the Miami Hurricanes football team. He also competed for the Miami Hurricanes track and field team; he held the Miami indoor school record in the shot put until Isaiah Simmons surpassed it in 2013. In his freshman season, Wilfork did not start but played in every game as a defensive tackle, finishing tenth on the team in tackles with 41 while also recording a sack and forcing three fumbles. Wilfork did not start a game in his 2002 sophomore season either, but still recorded 43 tackles and seven sacks. Before the 2003 season, Wilfork was rated the second best defensive tackle in the country by The Sporting News and went on to start all 13 games for Miami. He finished the year with a career high 64 tackles and led the team with 20 quarterback hurries. He was named to the All-Big East Conference first-team following the season, which would prove to be his last in Miami as he decided to forgo his senior season and enter the 2004 NFL Draft. Wilfork was ranked as the No. 2 defensive tackle going into the 2004 NFL Draft, behind only Tommie Harris. Although regarded as a top-10 talent, Wilfork was criticized for lackadaisical effort during his junior season, basically playing "not to get hurt." Wilfork drew comparisons to fellow Miami alumnus Warren Sapp, and was projected a mid-first round pick. The Patriots drafted Wilfork with the 21st overall pick. He was the highest selected Miami Hurricane defensive tackle since Damione Lewis in 2001. In his rookie 2004 season with the Patriots, he compiled two sacks, 42 tackles, and three deflected passes. 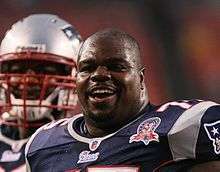 Wilfork saw considerable playing time during his rookie season, sharing the nose tackle position with veteran Keith Traylor and started Super Bowl XXXIX against the Philadelphia Eagles, a Patriots victory. Following Traylor's release, Wilfork had a career-high 54 tackles in 2005 and started all 16 games; however, the defending champions were eliminated in the second round of playoffs by the Denver Broncos. In 2006, Wilfork finished the season with 50 tackles, appearing in 13 games. In the 2007 season, Wilfork finished the season with 48 tackles and two sacks, was selected to the 2008 Pro Bowl, and was named as a second-team All-Pro selection. Wilfork was fined a total of four times by the NFL in the 2007 season. In the third game of the season he was fined $12,500 by the NFL for his hit on Buffalo Bills quarterback J. P. Losman, a hit which ended Losman's career as a starter. This was appealed to the NFL and reduced to $2,500. In an October 14 game against the Dallas Cowboys, Wilfork was fined $5,000 for drawing an unsportsmanlike conduct foul when he tangled with Cowboys tight end Jason Witten. In the last game of the regular 2007 season, Wilfork placed his finger in the facemask of New York Giants running back Brandon Jacobs after a play in the second quarter. He was fined $15,000. He was also fined $5,000 for a 15-yard face-mask penalty called in the AFC Championship Game against the San Diego Chargers, while attempting to tackle running back Michael Turner. Wilfork's string of fines continued into the 2008 season, when in an October 20 game against the Denver Broncos Wilfork appeared to elbow Broncos quarterback Jay Cutler in the head after a play. Wilfork met with NFL commissioner Roger Goodell in the days following the game and reportedly faced a one-game suspension, but after Wilfork explained his manner of playing to Goodell only a fine was imposed. Wilfork finished the 2008 season with a career-high 66 tackles, while recording two sacks. In 2008, he was also named for the first time a defensive captain, by his teammates. Wilfork during an August 28, 2009 preseason game against the Washington Redskins. Wilfork entered the final season of his contract in 2009. Reportedly unhappy with not receiving a contract extension, Wilfork did not attend the team's voluntary organized team activities in the spring, but reported to the team's mandatory sessions later in the summer. In August 2009, he was named to the Patriots' 50th anniversary team. Wilfork would go on to start the first 13 games of the season for the Patriots, missing the final three games of the season with an ankle injury before returning for the Patriots' playoff loss to the Baltimore Ravens. He finished the season with 43 tackles and no sacks, and he was elected to the 2010 Pro Bowl. Wilfork's contract expired after the 2009 season. He stated that he was looking for a long-term deal and threatened with a holdout should the Patriots instead place a franchise tag on him. In an interview with the South Florida Sun-Sentinel he also acknowledged it would be "a dream come true" to play for either the Tampa Bay Buccaneers or the Miami Dolphins. On February 22, Wilfork was assigned the non-exclusive version of the franchise tag by the Patriots, who expressed their desire to reach a long-term contract with Wilfork. On March 5, the first day of free agency, the Patriots re-signed Wilfork to a five-year, $40 million contract with $25 million in guaranteed money. After starting the first three games of the 2010 season at nose tackle, Wilfork moved to defensive end beginning in Week 4 against the Miami Dolphins. He returned to start at nose tackle in the Patriots' Week 8 win over the Minnesota Vikings. He would continue to switch between the positions for the remainder of the season, but started all 16 games and finished with 57 tackles and two sacks. Wilfork was selected to the 2011 Pro Bowl after the season. Wilfork was named to the 2010 AP All-Pro Second Team at defensive tackle, finishing third in the voting, but also received a vote at defensive end. At the start of the 2011 NFL Season, he played defensive tackle when the New England Patriots moved to a 4–3 defense thanks to his former teammate Albert Haynesworth and after playing nose tackle for the first seven NFL seasons. In the second game of the 2011 season, Wilfork got his first career interception off San Diego Chargers quarterback, Philip Rivers. He caught his second interception against the Oakland Raiders two weeks later. He scored a touchdown on week 14 against the Washington Redskins at the FedEx Field. During the 2011 season, Wilfork recorded 3.5 sacks—a new career high—and was included on the AFC's 2012 Pro Bowl roster. In the 2012 AFC Championship game vs. the Ravens, he had one of his best games of his career, recording 1.5 sacks and 6 tackles. Wilfork was selected as a defensive tackle for USA Football's 2012 "All Fundamentals Team", which honors 26 NFL players each year for executing the fundamentals of their position. He was also named to his fourth career Pro Bowl team and to the All Pro second team. In 2012, he was voted co-captain for the fifth straight season by his teammates. He finished the year with 48 total tackles and 3 sacks. His strong season earned him a spot in the Associated Press All Pro first team and in the 2013 Pro Bowl. In week 4 of the 2013 NFL season against the Atlanta Falcons, Wilfork tore his right Achilles' tendon while trying to get past Falcons offensive guard Justin Blalock. Wilfork would miss the rest of the 2013 season after being placed on injured reserve. In March 2014, Wilfork re-signed to a three-year $22.5 million deal. In the 2014 NFL season, Wilfork recorded 47 tackles, 2 passes defensed and 1 interception. He helped the Patriots reach Super Bowl XLIX. In the Super Bowl, Wilfork recorded 2 tackles as they defeated the Seattle Seahawks 28–24 to give Vince his second Super Bowl championship. On March 16, 2015, Wilfork signed a two-year deal with the Houston Texans. He started all 16 games in 2015 at the nose tackle position making 22 tackles. Wilfork has lived in Franklin, Massachusetts, with his wife Bianca and their three children (two sons and one daughter). Following the Patriots victory in the 2015 AFC Championship game, Wilfork helped pull a driver out from an overturned vehicle. He noticed the flipped SUV on his way home from Gillette Stadium, assisting an officer already at the scene. Wilfork later recounted the event and his role in helping the driver: "I think anybody would do the same thing, I saw the lady in there and asked her if she was OK, could she move. She grabbed my hand, and kind of talked her through [it]. It wasn't a big deal; it was seeing someone that needed help and helping. I was just trying to get her to safety." ↑ Gasper, Christopher L. (2008-11-28). "He's one of the best". The Boston Globe. Retrieved 2009-05-20. ↑ "Best run stuffer? Finding the best defensive tackle in the NFL". USA Today. 2008-07-06. Retrieved 2009-05-20. ↑ "Results of 2000 Outdoor State Meet Class 4A". DyeStat Florida. May 13, 2000. ↑ Barboza, Scott (December 14, 2007). "Under the Helmet: Vince Wilfork". New England Patriots. ↑ "Vince Wilfork, DT, Miami". USA Today. 2005-05-18. 1 2 3 Pasquarelli, Len (2008-01-04). "Patriots' Wilfork fined for third time this season". ESPN.com. Retrieved 2009-05-20. ↑ Pasquarelli, Len (2008-01-26). "Patriots' Wilfork fined $5,000 for face-mask infraction against Chargers". ESPN.com. Retrieved 2009-05-20. ↑ Kilgore, Adam (2008-10-30). "Wilfork avoids suspension". The Boston Globe. Retrieved 2009-05-20. ↑ Gasper, Christopher L. (2009-06-03). "Wilfork stays away". The Boston Globe. Retrieved 2009-09-12. ↑ Kelly, Omar (2010-01-28). "Vince Wilfork: Playing in Florida would be 'a dream'". South Florida Sun-Sentinel. Retrieved 2010-01-29. ↑ Reiss, Mike (2010-02-22). "Pats, Wilfork hope for long-term deal". ESPNBoston.com. Retrieved 2010-02-22. ↑ Reiss, Mike (2010-03-05). "Wilfork signed to record deal". ESPNBoston.com. Retrieved 2010-03-05. ↑ "Final from the Black Hole: Patriots 31, Raiders 19". BostonHerald.com. Retrieved 2011-10-02. ↑ "Wilfork digs deep for first touchdown". Providencejournal.com. Retrieved 2011-12-24. ↑ "2012 Pro Bowl rosters". NFL.com. December 27, 2011. Retrieved 2012-10-30. ↑ USA Football All Fundamentals Team Retrieved January 7, 2013. ↑ "Source: Wilfork has torn Achilles' tendon". Boston Globe. September 30, 2013. ↑ Wesseling, Chris (October 3, 2013). "Zach Sudfeld waived by Patriots; Vince Wilfork to IR". National Football League. Retrieved October 3, 2013. ↑ Reiss, Mike (2015-03-05). "Pats decline Vince Wilfork's option". ESPN.com. Retrieved 2015-03-05. ↑ McClain, John. "Veteran defensive lineman Wilfork agrees to two-year deal with Texans". Houston Chronicle. Retrieved 16 March 2015. 1 2 "Vince Wilfork". ESPN. Retrieved 30 December 2013. ↑ The Secret Lives of the Players' Wives Bostonmagazine.com (May 2005). Retrieved on February 14, 2015. ↑ Reiss, Mike. "ESPN New England Patriots News Reporter". ESPN.com. Retrieved 19 January 2015.